JACKSONVILLE, Fla. -- The Carolina Panthers had a big defensive play and a big defensive loss in a season-opening win. Josh Norman returned an interception for a touchdown, star linebacker Luke Kuechly sustained a concussion and the Panthers did just enough offensively to beat the Jacksonville Jaguars 20-9 on Sunday. Norman provided the big play in the third quarter when stepped in front of a pass intended for rookie running back T.J. Yeldon near the sideline and went untouched the other way for a 30-yard score. Norman pointed at Jaguars quarterback Blake Bortles as he trotted toward the end zone and then waved bye-bye. Carolina managed just 263 yards in winning its second consecutive opener. Cam Newton, playing in his first game since signing a five-year, $104 million contract, completed 18 of 31 passes for 175 yards and a touchdown. He also ran for 35 yards and threw an interception. Newton found Jerricho Cotchery in the back of the end zone in the second quarter for Carolina's only offensive touchdown. The Panthers entered the game trying to find out who would replace injured receiver Kelvin Benjamin. Cotchery caught four passes for 45 yards. Ted Ginn Jr. had two receptions for 54 yards. Ginn also dropped what probably would have been a touchdown in the first quarter. It was a sloppy game all around for the Jaguars, who have dropped four consecutive openers. Allen Hurns, Allen Robinson and rookie Rashad Greene dropped passes for Jacksonville. Rookie kicker Jason Myers missed a 44-yard field goal and an extra point. And Bortles was off all day. He finished 22-of-40 for 183 yards, with a touchdown and two interceptions. His first one was the fifth "Pick Six" in his 14 career starts. Carolina's defensive effort - the Panthers held Jacksonville to 265 yards - came without standout defensive tackle Star Lotulelei (foot). The Panthers also played the second half without Kuechly. Kuechly wobbled to the ground after hitting Yeldon late in the first half. Kuechly tried to stand back up, but dropped to the ground again. He was immediately taken into the locker room, and the team later said he would not return. Kuechly signed a five-year, $62 million contract earlier this week. He was one of several players injured in the game. Jaguars left tackle Luke Joeckel injured his left ankle three plays after Kuechly was hurt and did not return, and cornerback Aaron Colvin injured a shoulder. 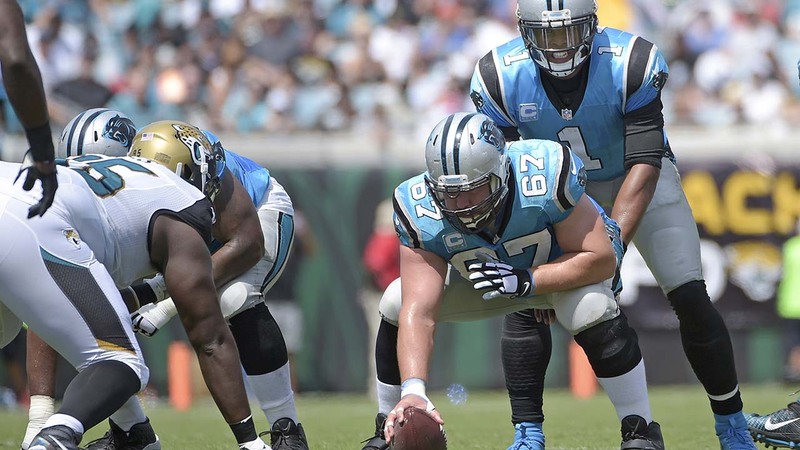 Panthers backup offensive tackle Daryl Williams left the game in the first quarter with a right knee injury.